Earlier this year we brought you the details of the IHG Rewards Club hotel category changes and said it wouldn't be too long before we saw other hotels release their annual changes. Now that we are back from vacation we are playing catch up as two chains released these changes last week! First off was Marriott Rewards as they announced the changes on FlyerTalk and summarized all the hotels changing here. 62% of all the properties will remain in Categories 1-4. *NEW! * – March 24, 2016 is also the day you can begin mixing cash and points for reservations of one night or more using the NEW Cash + Points. The good news for those of you redeeming for stays in Canada is that we saw many hotels go down by one category while only three went up by one. 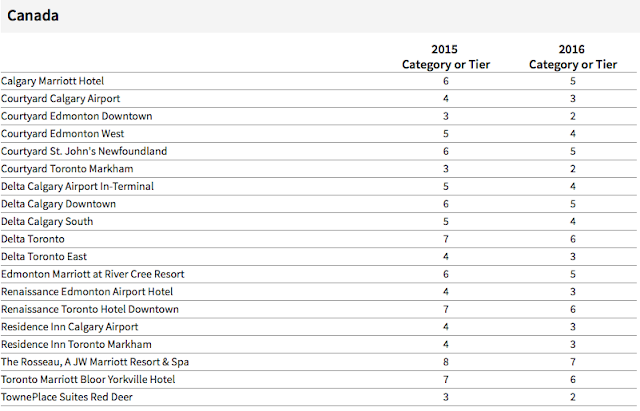 Of course the province that is hurting right now, Alberta saw the largest percentage of those hotel drops as 11 of the 19 properties going down are in Alberta. Somewhat surprising is seeing 6 locations in the Toronto also go down! So what does this mean for Marriott Rewards members? Well take a look at the complete list of hotel changes here to see if any hotels you have currently booked with points or are planning to book with points to see if they are moving up or down. If the location(s) are moving up then you'll want to lock in your booking before March 24th when these changes take place as you'll still be able to redeem at the current 2015 rates. Remember Marriott allows you to book almost a year out so you can book stays in 2017 at this time. However if one or more of planned redemptions is at a location moving down a category you'll want to hold off until March 24th to book to ensure you use less points for that redemption. Already booked for a stay after March 24th? Once that day comes check to see if the hotel has award nights available at the lower rate, book it and then cancel your old award reservation. Also embedded in this news is that March 24th will also be the official launch of Marriott Rewards' Cash+Points option which detailed sometime ago. The great news for Canadian redemptions and the 30% of hotel changes that go down a category means that you have some more options to utilize the free nights received from the Marriott Rewards Premier Visa Card, of course on the flipside you have quite a few hotels (500+ Worldwide) that will cost you more points or become ineligible for the free night from this credit card.